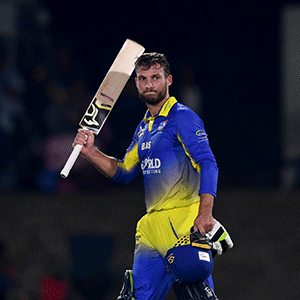 Cape Town - Janneman Malan's sensational century enabled the Cape Cobras to strike back from a heavy midweek defeat and seal a lop-sided seven-wicket bonus-point win over the Warriors in their latest CSA T20 Challenge encounter in Paarl on Friday. The right-hander plundered 12 fours and a six on his way to 103 not out off 57 balls - which helped the hosts comfortably chase down a 152-run target with 25 deliveries to spare. It was Malan's second 20-over century, but first at franchise level and kept the crowd entertained throughout at Boland Park. Earlier it was Aviwe Mgijima that was the unlikely hero with the ball for Ashwell Prince's side. The medium-pacer nabbed a career-best three for 14 to restrict the visitors to 151 for eight after the home side had won the toss and elected to bowl first. He shared in an opening stand of 61 with Hashim Amla, whose seven off 12 balls was probably the only major blip for the Cobras as the veteran Proteas opener battles to find his form.